The calla lily, also known as the arum lily, is one of the most popular wedding flowers and has been since ancient times. Once only available in white, the calla lily wedding bouquet became a classic, white flowers with bright yellow centers brought color to an otherwise all white wedding look. As time passed smaller versions of these classic flowers appeared and the price dropped, making calla lilies even more desirable. Their popularity surged, with only one problem remaining, how to avoid one calla lily bouquet looking much the same as any other. Here are four ways you can make your calla bouquet stand out from the rest. Go for color. Calla lilies are now available in a variety of colors, from white to pink, yellow, orange, flame, yellow, red, burgundy, lilac, purple and a shade that is very close to black. Burgundy, purple and almost black are excellent choices for the gothic bride, add feathers for a change of texture or some more unusual plants, we've even seen silk calla lilies with artificial pitcher plants. And if you can't find the color you want? Spray white callas any color you like! Forget Hand-tied Bouquets. Cascade bouquets are back 'in' so forget those hand-tieds and go for something more interesting. Worried about the cost? Cascade bouquets usually use fewer flowers than a substantial hand tied bouquet, and with some practice you can still DIY if you want to get. Buy some cheap silk flowers and have a go. 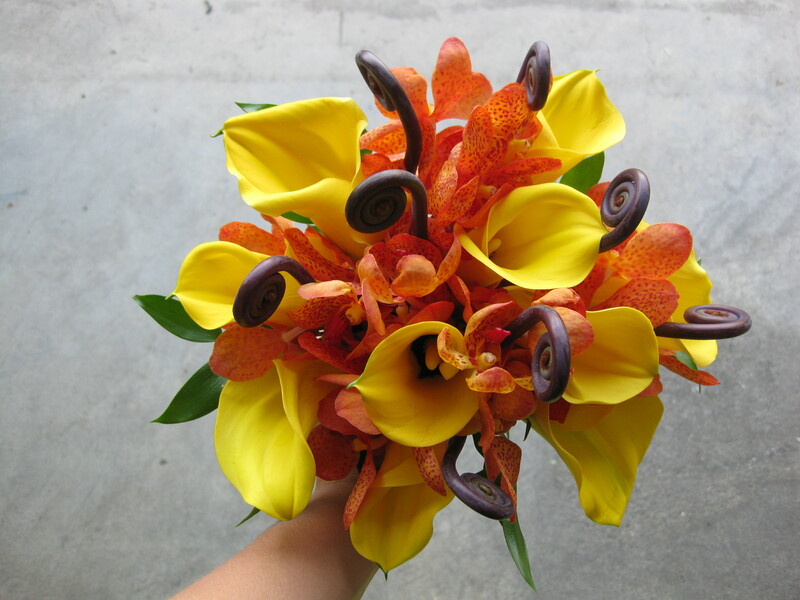 If you think a cascade bouquet is beyond you, full size calla lilies are ideal for wand style bouquets. Gather three or four together, just below their heads, add some foliage and add some stalks of lavender for added scent. Use Unusual Mixers. Calla lilies have a distinct texture with their smooth sides and even color. Many brides carry hand tied bouquets of mini callas alone, but you can create a far more striking bouquet by teaming calla lilies with an unusual, more 'feathery' texture. Seeded eucalyptus is available in many colors and looks wonderful in gold, ideal for a fall bride. Feathered celosia is another excellent accent for a lily bouquet, and while the all white look is a bridal classic, adding green to the bouquet just seems to accent the white, add celosia in apple green, or trails of ivy for a 'back to nature' look. Hard Edge. Another way to make your wedding bouquet look different is to use a bouquet collar. In the past these were usually frilled and make of lace or tulle, designed to provide a backing for a delicate posy. The latest bouquets collars are rather different. Metallic wires make an interesting accent, gold, silver and copper collars are available trimmed withe pearls, but you can also find more vibrant colors such as green, rose, brown, black, strong pink and turquoise. The collars are not expensive and will add an unusual metal accent which you can echo in your centerpieces; add a collar to a vase, use flat wire shaped in spirals as an accent (ideal for monochromatic color themes) or add beaded wire to the vase or stems in your centerpiece arrangements. Calla lilies are beautiful flowers and there are many, many ways to use them to create elegant, unique bouquets and centerpieces for your wedding.